The posters were clearly intended to grab attention, create a ruckus and incite enmity and anger amongst the students belonging to different castes and religions. 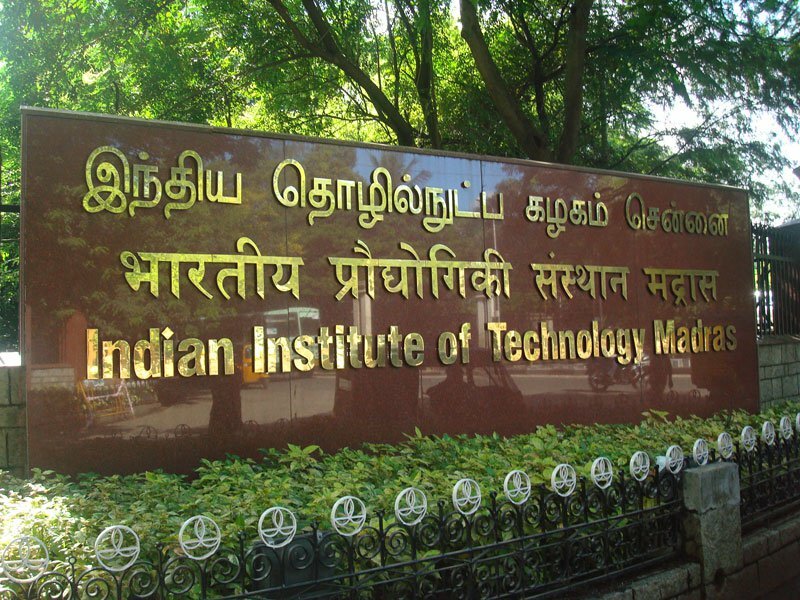 IIT Madras has always maintained a very friendly environment where students are rarely discriminated on the basis of caste, creed or religion. Such posters threatened to destroy the friendly atmosphere in the college and hence a few students at IIT Madras decided to write to the HRD ministry to bring it to their notice. 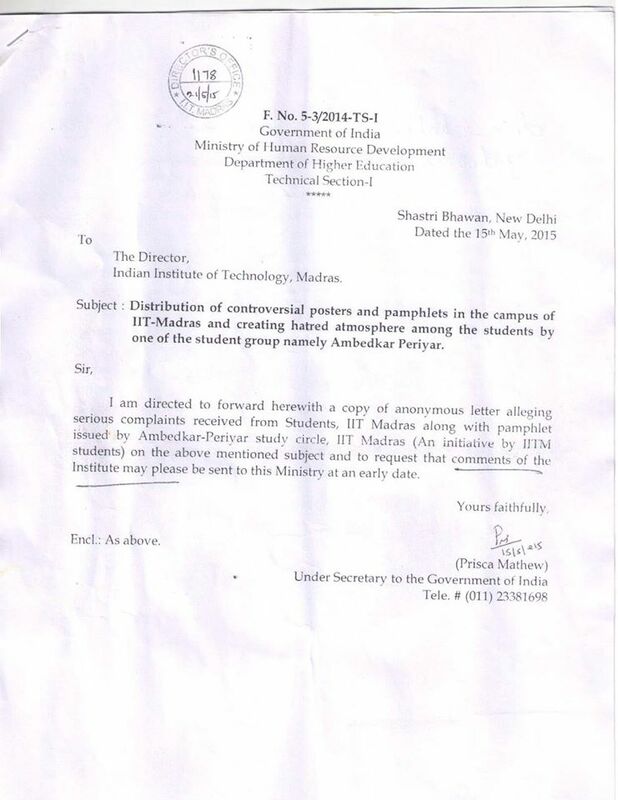 The HRD ministry sent a letter to the Director of IIT Madras, asking their views on the same. Note that the HRD ministry never asked the institute to ban the organization. 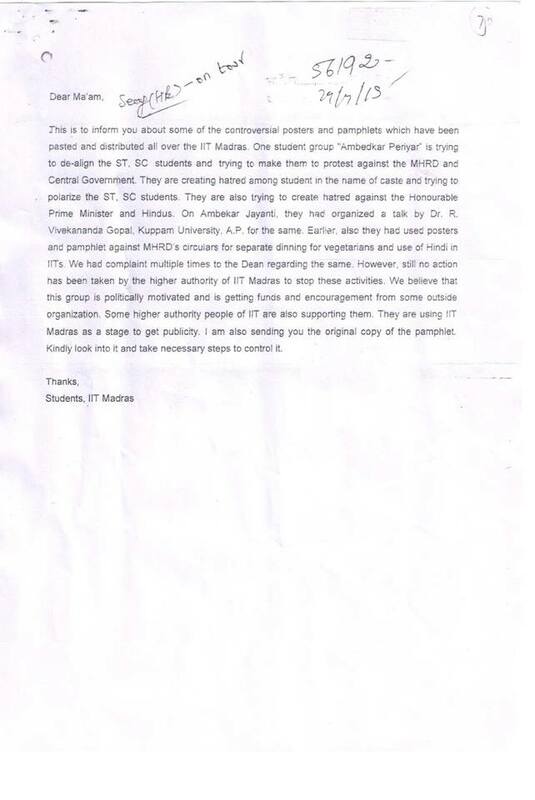 Is should be noted that concerns were raised against creating enmity in the campus, and not against criticizing the PM. This is not a new issue. Members of this organization have been criticized for creating enmity even in the past also. This was clearly visible in the recent student elections in IIT Madras in which one of the contesting candidates who is closely associated with this organization tried to give away freebies to members of some castes in order to garner votes. 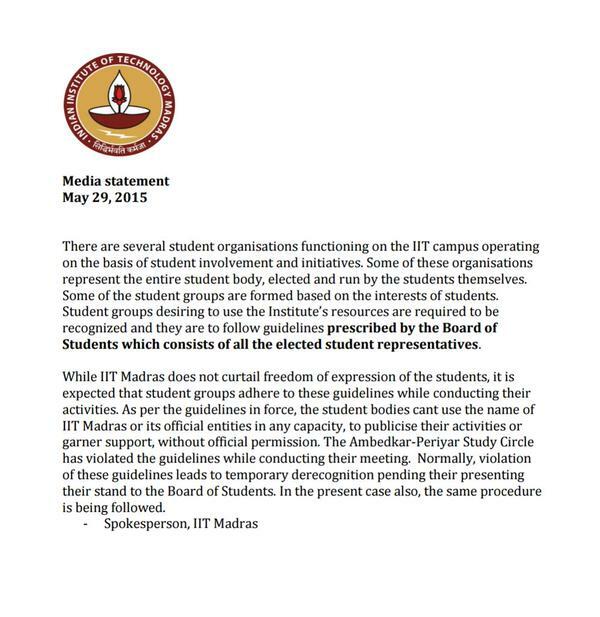 This move was severely criticized by the majority of the students in IIT Madras. 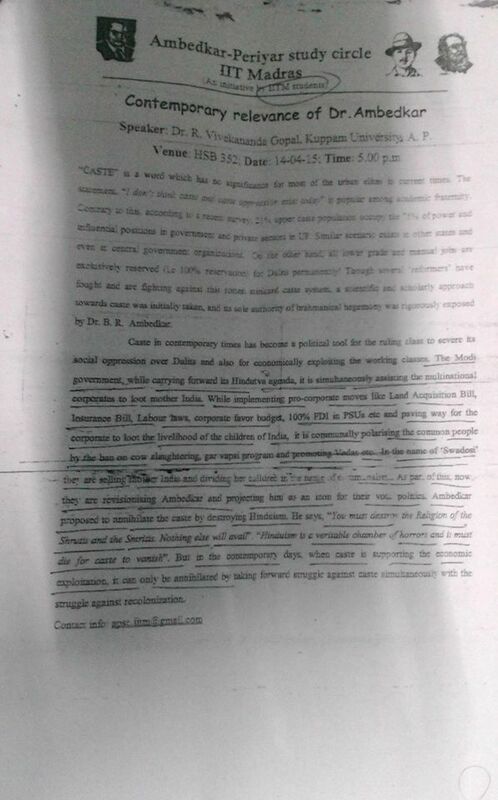 A similar organization named Revolutionary Student Youth Front also tried to charge students against each other by putting up provocative posters. Another poster put up the APC, the text of which has been posted below tried to spread venom against the use of Hindi language. Our administration has been replacing the name board of the faculties and laboratories in Sanskritized Hindi since two weeks. This being part of the “Sanskrit (imposition) activity” of Modi government in central government organizations. From onwards, it’s been a debating issue concurrently receiving massive opposition from intellectuals, and social activists. Particularly, in science and technology sector this results an immense pessimistic approach and even disgraceful among all sectors. To say, “Engineering design department” is translated as “Abhiyanthrik Abikalpith vibhag”. “Abhikalpith” used in name board is not derived from the regular Hindi dialect but is merely Sanskritized Hindi word, which even the native Hindi speakers unrecognized. These translations will never impart scientific temper and also it neither creates the mental picture of any scientific concept. Then, what’s the real necessity and use of Sanskritized Hindi name board? The answer is associated with recent claims from ancient mythologies! Recently, Indian science congress, reported the usage of fly machine 7000 years ago (around 5000 B.C) based on “Vimanika Shastra”(written in early 20th century) claimed to be written in Vedic period (around 1900-500 B.C). Mr. Modi claim about the birth of Gowravas in ghee pot (like a pickle preserved in the oil!?) as genetic engineering in Mahabharata and replacement of elephant’s head instead of human head (how about the neck radius?!) to Hindu god Ganesha as an example of plastic surgery in ancient times. All the above claims are unscientific and consistently derision our scientific methods. The promotion of Sanskrit as knowledge source and their try to establish through mythological claims as science and tech are part of Brahminical hegemony, the core of hindutva politics of BJP/RSS clowns. So, this is not merely an issue of a language in the name board instead it is saffronisation of reasoning without a scientific temper. As professional researchers and technocrats, it is inevitable for us to strongly condemn the admin decision and we cannot allow robbing our modesty in front of such insanities. 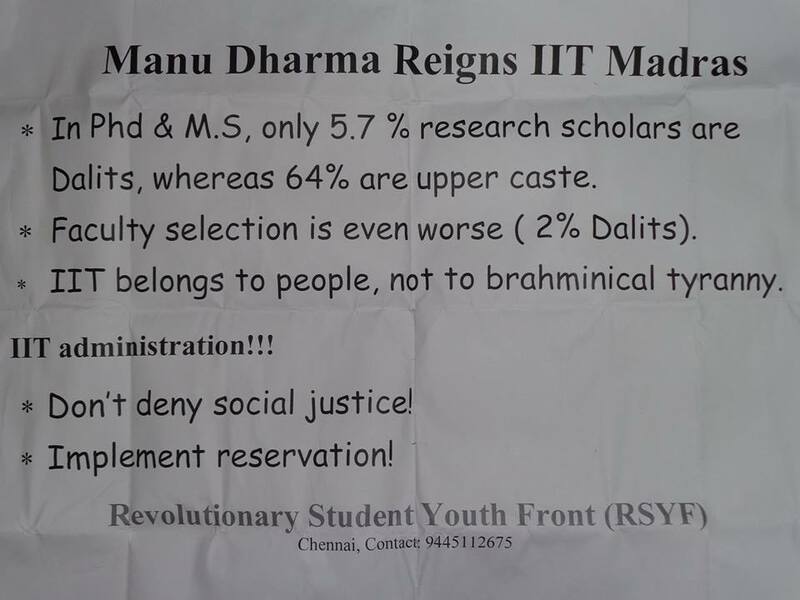 Such posters threaten the communal harmony of IIT Madras. This is why a group of students wrote to the HRD ministry. Sadly, lots of people who have no clue about the institute started blaming the government instead of contemplating and considering the details. IITs don’t promote Brahmanic culture. In fact, lots of students who study in IITs belong to the lower or the lower-middle class. The official statement is out. IIT Madras official news-editorial team will compile and publish the relevant details by the evening.